Computational modeling involves not only the consideration of a host of physical issues, but also there are many aspects associated with numerical approximations that likewise have to be addressed. The articles in this section of CFD-101 focus on some of the more important numerical issues. First and foremost issue is the question of numerical stability; a simulation that is not computationally stable is useless. 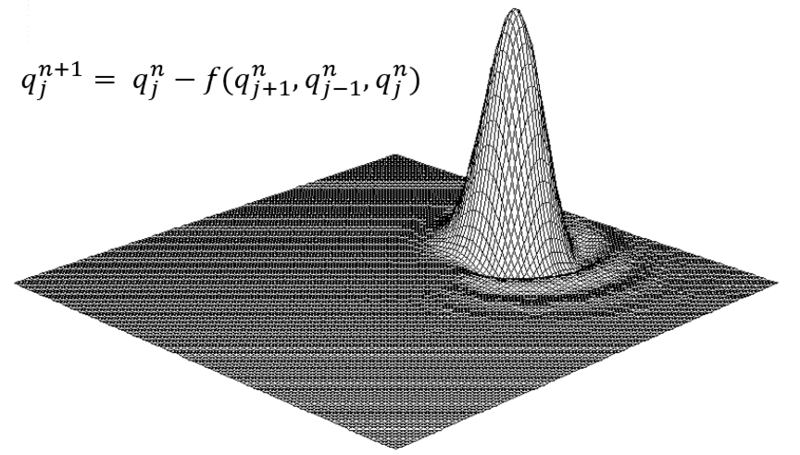 There are four separate articles on stability considerations beginning with a discussion of the classical Fourier analysis method originated by von Neuman. This is followed by a discussion of an approximate method referred to as a Heuristic Stability analysis that often provides useful insight into what causes instability and how it might be repaired. A third article explains, using a simple mechanical model, one common type of numerical instability involving an action-reaction process. Finally, there is the article Unconditional Numerical Stability that describes a simple way to determine if a numerical approximation of an evolution equation is likely to be unconditionally stable or not. Result of advecting a Gaussian field using the Lax-Wendroff numerical scheme. Note the spurious waves formed downstream of the Gaussian (denoted by the arrow) - such errors are purely numerical and can be categorized as dispersive errors. Image courtesy: Dr. Brian Jewett, Dept. of Atmospheric Sciences, University of Illinois at Urbana-Champaign. Dr. Jewett is a research scientist working on numerical weather modeling and computational fluid dynamics.